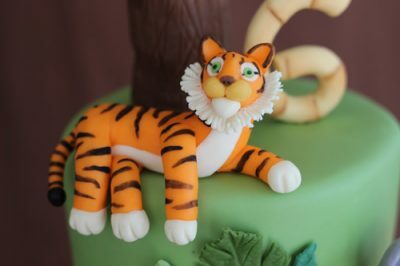 It’s been a while since I last did a tutorial so I am really excited to share my latest cake with you as well as give you instructions on how I made it. 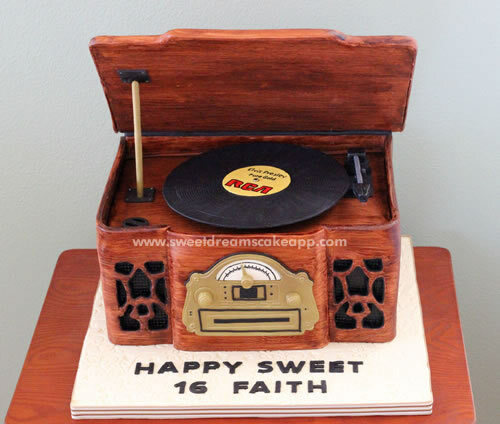 My youngest daughter just celebrated her 16th birthday (how can I possibly be that old already?!) so we had a Sweet 16 party for her. We celebrated at a dance studio and all of her closest friends joined us for swing and foxtrot lessons then an evening of dancing. It was such a fun and memorable night. Of course, I wanted to make her a very special cake to go with this special evening. 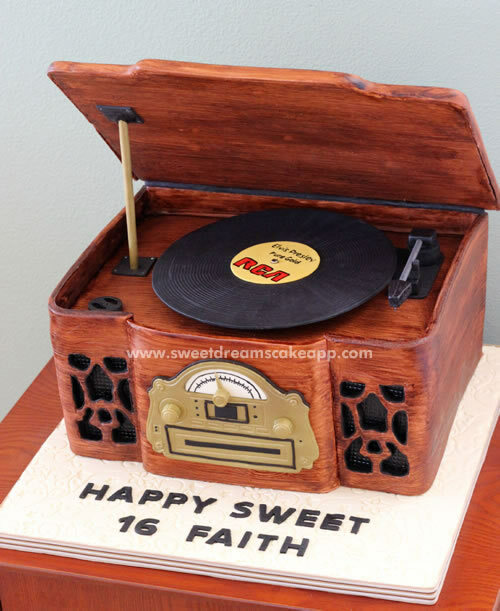 She asked me to make her a cake that looked like her beloved record player. I was thrilled to do it, but I had to add something to make it really over the top. I decided to make it spin just like a real record player. I honestly wasn’t sure if it would work, but I had to give it a try. To my delight (and her’s) it worked perfectly! In fact, everyone was shocked that it was actually a cake. 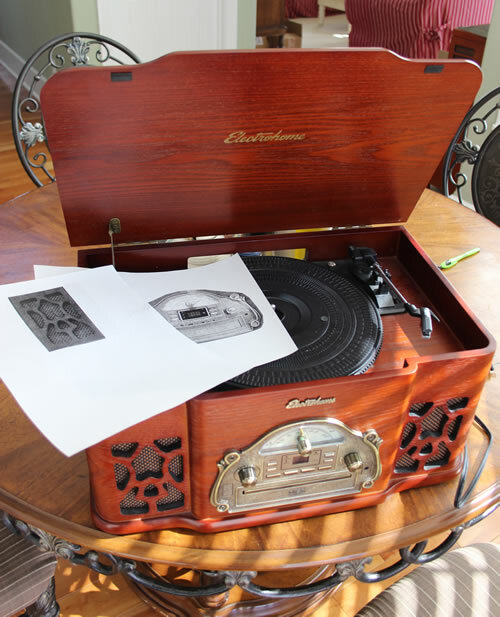 Some people thought it was a real record player despite the fact that it was smaller than a real one. And, just in case you need some proof that this is real cake too, I took a picture after we cut into it. Ok, enough photos of the cake and on to the making of it. 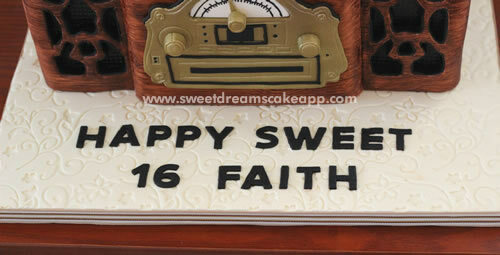 Whenever I start a sculpted cake, I try to collect as many patterns and photos as I can. In this case, my daughter wanted it to look like her record player so I was lucky because I had the actual record player to use as a reference. 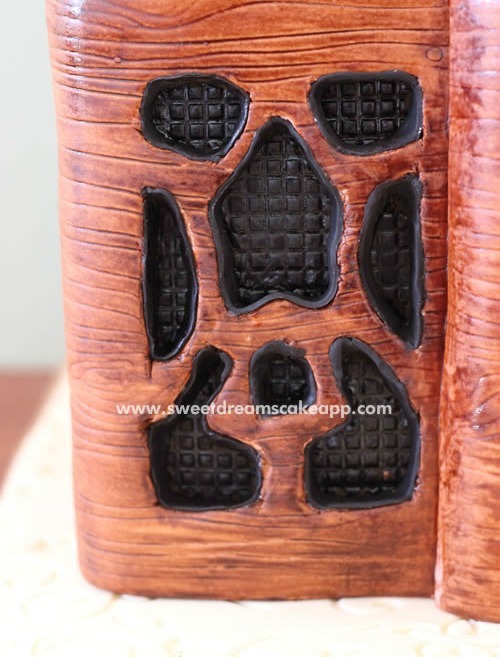 I also went online and found a picture of it so that I could print out some patterns to use for things such as the face plate and speakers. I found this little motor on Amazon.com that turns almost the same speed as a real record player. My husband wired it up for me. (*See bottom for his full explanation on how to wire the motor.) 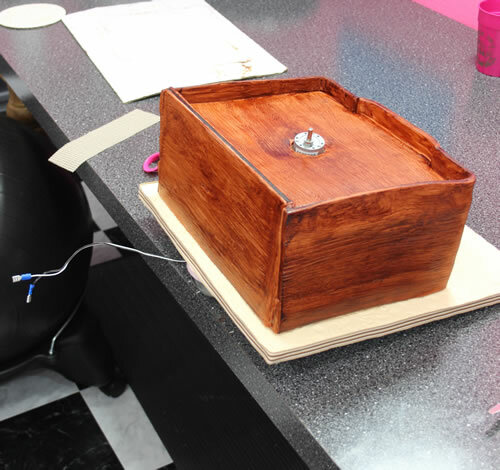 He also cut a piece of PVC pipe for the motor to set in, inside the cake. I then baked the cakes and made chocolate ganache for the filling and crumb coat. 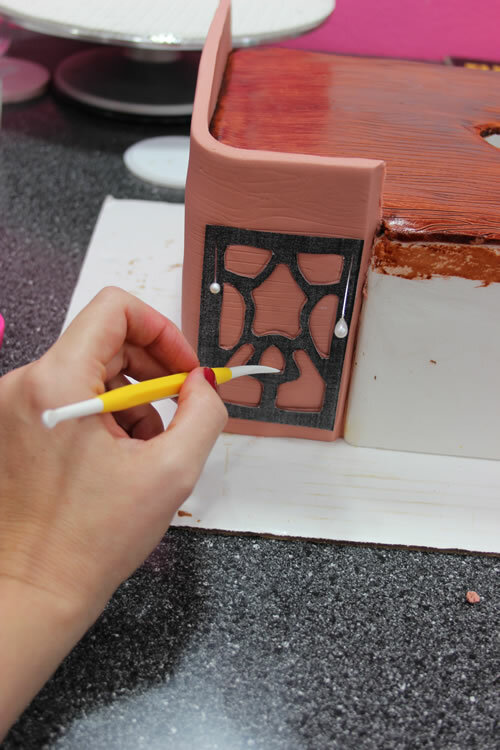 When you are figuring the height of your finished cake you have to take into consideration the cake board, height of filling and thickness of fondant along with the height of each cake layer. 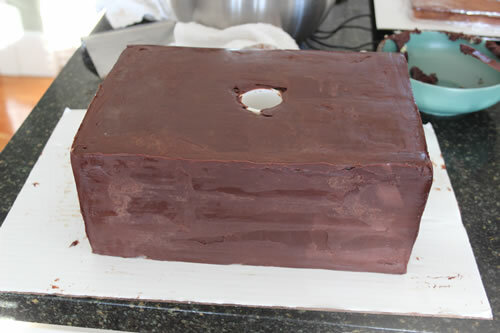 I added a cake board in the middle of the cake, to make it easier to cut into, so once I added the bottom cake board, the middle cake board, the fillings and fondant I figured out that I needed 4″ total of cake so I made each of the four layers 1″ high. 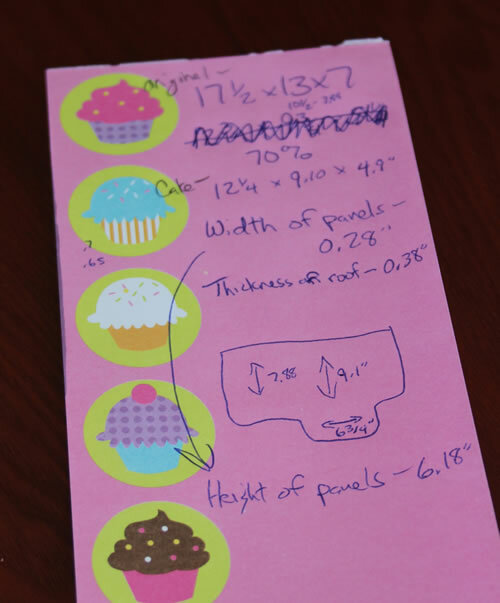 Using the measurements I had figured earlier, I cut a cake board to the size I wanted and used that for my cutting pattern for the cakes. Disregard the line on the board; I had measured wrong the first time and had to redraw my pattern. 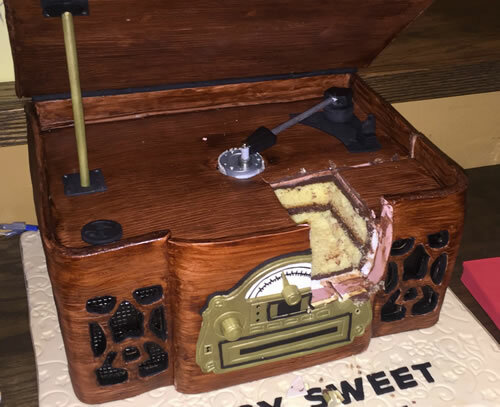 I also measured and figured where the location of the motor would be in the cake then made holes at that location in each of the cake boards so that the wires could run through them. 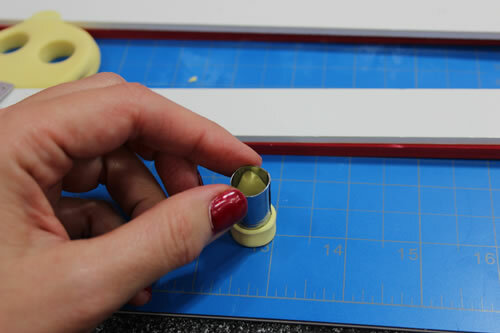 Next I used a round cutter that was about the same size as the PVC pipe and cut out holes in each of the top two cake layers where the motor would go. The PVC only had to fit into the top two layers because I had the cake board in the middle of the cake that it would rest on. 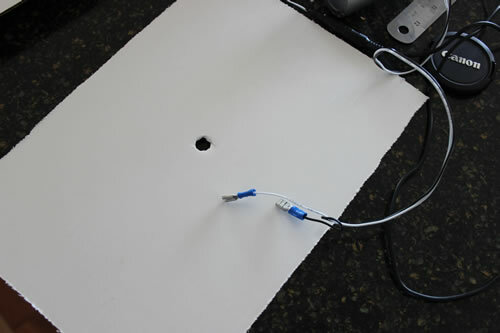 I made a smaller hole in the bottom two layers that was big enough for the wires to run through. I didn’t get a picture of any of that though. 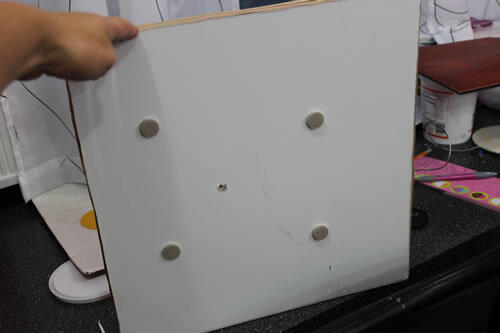 I then filled and stacked all the cakes, lining up the holes in the cakes with the holes in the cake boards. To be safe, I placed some dowel supports in the bottom layers to hold up the center cake board since I knew the fondant would be heavy. I then crumb coated the entire thing in chocolate ganache. I don’t have the best skills with ganache yet but, fortunately it was all going to be covered with thick fondant so it didn’t matter that it wasn’t perfectly smooth. 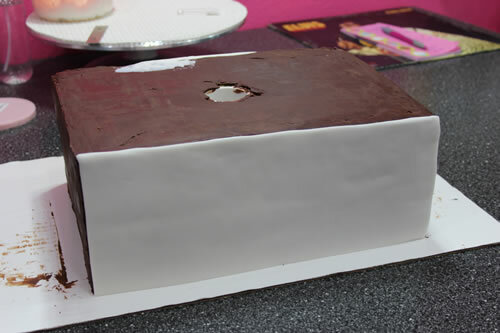 Finally, I inserted the cleaned PVC pipe into the hole of the cake. Now it was time for the fun stuff. 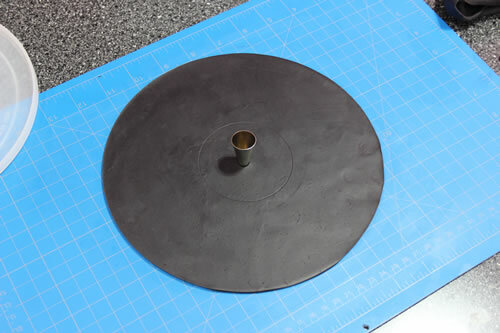 I made a batch of black modeling chocolate, rolled it thin then cut out a circle for the record. My mixer bowl cover was the perfect size so I used that for my pattern. 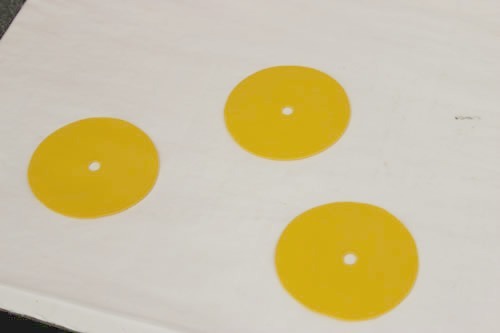 I used a circle cutter to make an indention where the label would be located and then used a decorating tip to cut out the center of the record. I had found this clay sculpting tool at the craft store and it turned out to be the perfect tool to make the indentions around the record. 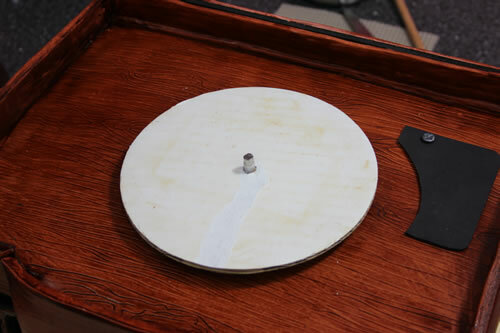 With the record laying on a turntable, I held the tool in place and slowly spun the record around in a full circle. 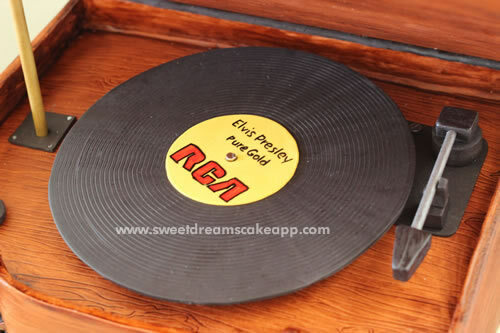 My daughter’s record player protrudes in the front so I cut out a thick piece of modeling chocolate and cut it to size. 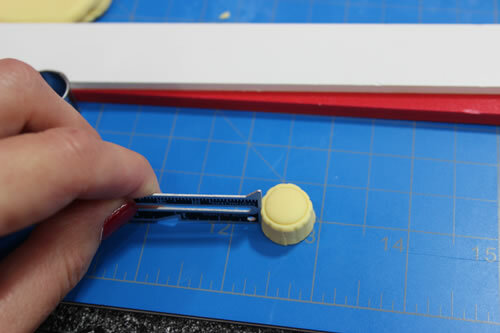 I love using my Perfection Strips to get even thicknesses when I roll things out. 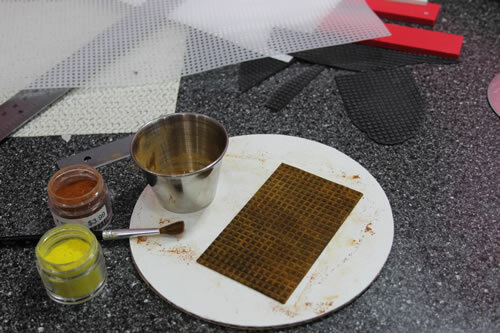 I also rolled out a thin amount of modeling chocolate and cut out two speaker backings then used a plastic cross stitch canvas to press over them and make indentions. 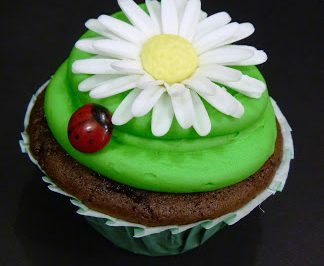 I also dusted them with some petal dusts so that they would have a little color and depth but that was a mistake because it all rubbed off after I placed fondant over them, as you will see. 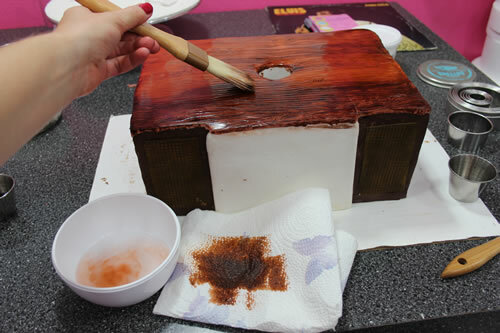 I then attached the protrusion piece and the speaker backings to the front of the cake with a little piping gel. 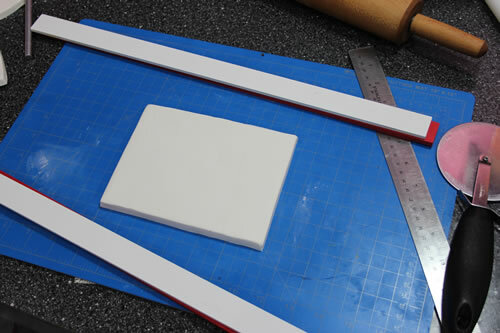 I attached a thin piece of fondant on the back of the cake because I was going to need to attach a piece of foam board there later on, to support the weight of the lid, and I wanted a barrier between the foam board and the cake. 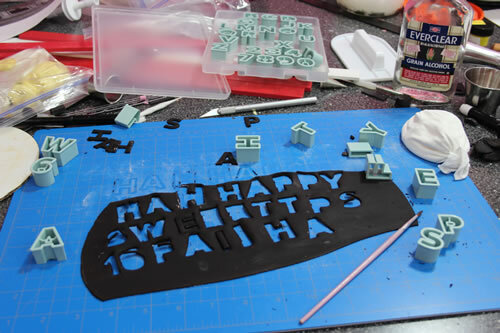 Now to cover everything in fondant. Getting the right color was the tricky part. 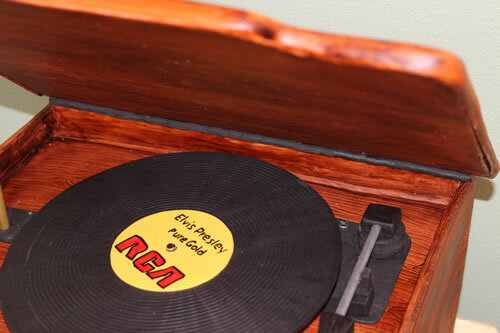 The original record player is a reddish, cherry wood color. I am not that great with color mixing so I spent some time experimenting with different colors and techniques before I finally came up with this. 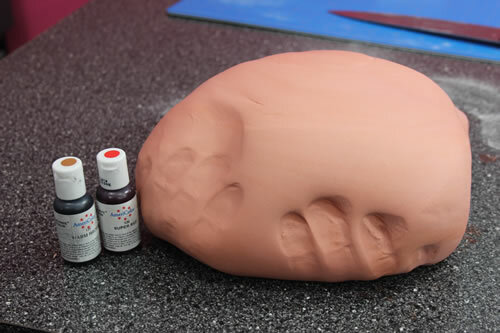 I started by mixing some Warm Brown gel color with a small amount of Super Red until I got this light reddish-brown color of fondant. As you will see, I later brushed air brush coloring over it to intensify the color. 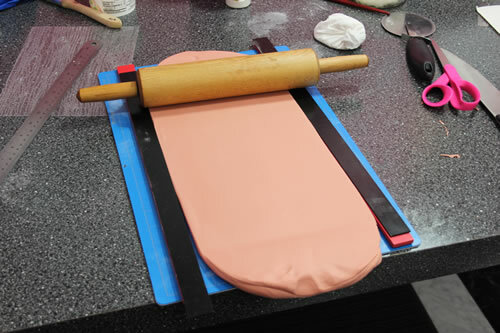 I rolled out a large, thin piece of the fondant and used a fondant smoother to press a wood grain texture sheet onto it. 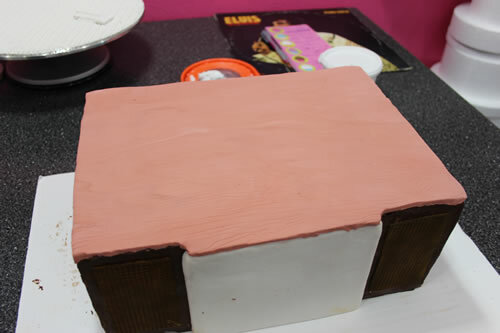 Once fully covered with texture, I laid the fondant on top of the cake and trimmed it to fit. This really brought out the wood grains and added more color but it added a little too much color so, while it was still wet, I went back over it with the same brush wiping off the excess color and cleaning the brush in between strokes with some water. 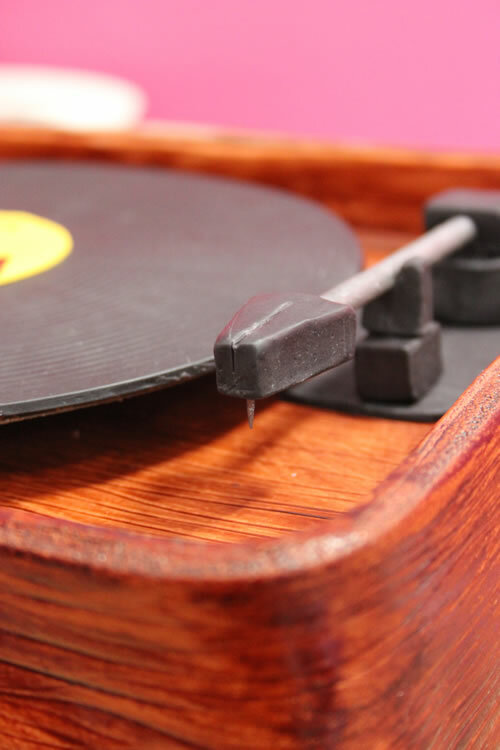 I ended up loving the result because it gave the reddish brown look of the cherry wood as well as a little bit of shine that resembled the finish on the original record player. 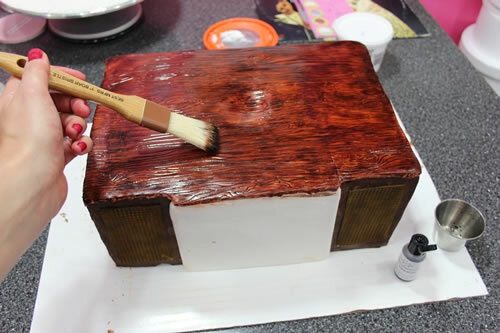 I used this same technique for all the rest of the wood paneling on the cake. 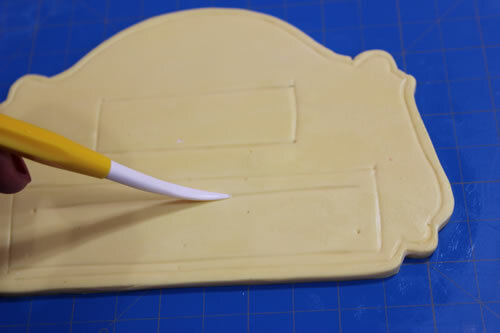 With a small knife, I cut away the fondant from the top of the PVC pipe. The sides of the cake needed to be thick and firm so that they could rise up above the surface. 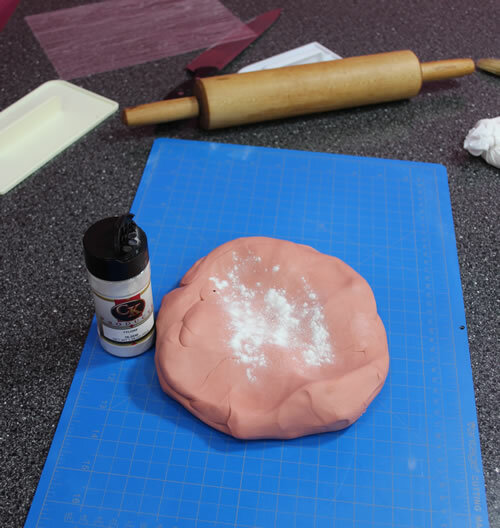 I kneaded some Tylose Powder into the fondant to give it strength and help it dry quicker. I used my Perfection Strips again to roll out the sides to an even thickness. I had determined how thick they needed to be earlier when I did all my measurements. 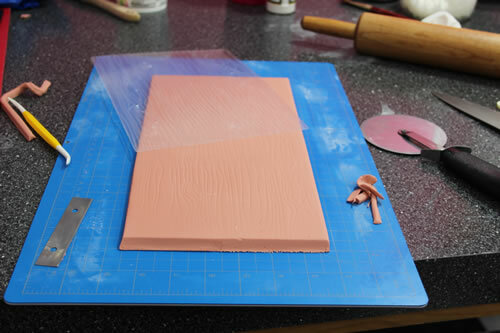 Again, I pressed the wood grain indention sheet onto the fondant then cut it the height and length I needed and attached it to the side of the cake with some piping gel. 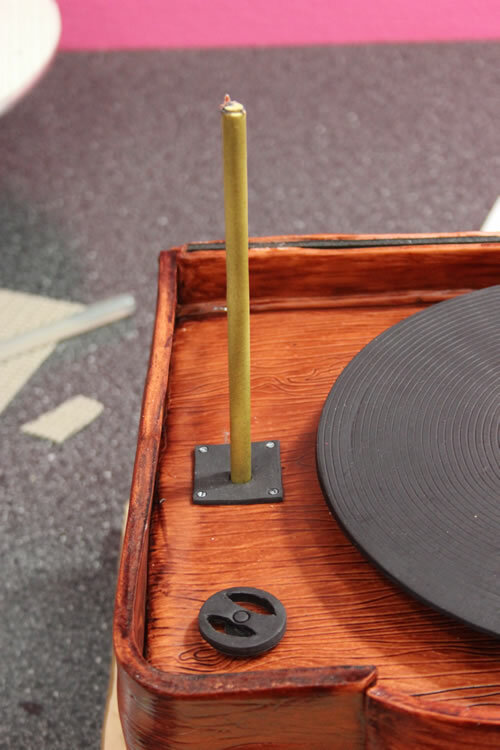 The original record player is rounded on the front corners so I didn’t want seams on them. Instead, I measured the length from the back corner of the cake all the way around to the edge of the modeling chocolate protrusion piece. I did this for each side. 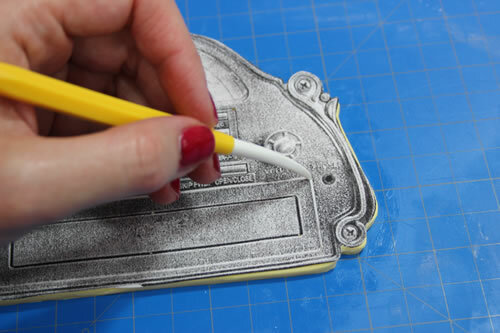 Using my printed speaker pattern, that I got from online photos, I attached it with straight pins and used a veining tool to mark the cutouts in the fondant. 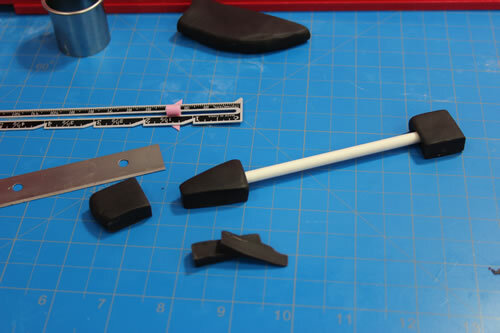 I then removed the pattern and used and X-Acto knife to remove all the cutouts. As I mentioned earlier, I needed to add some foam board to the back to serve as a support for the lid later on so I cut a piece to size then covered it in fondant and attached that piece to the back of the cake with some melted candy melts. 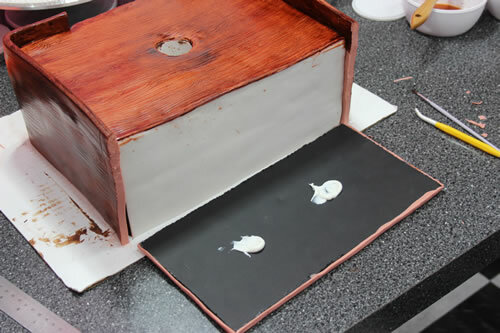 I finished up the siding by covering the protrusion piece with fondant and coloring it just like I had with the rest of the cake (although it is not yet colored in this photo.) 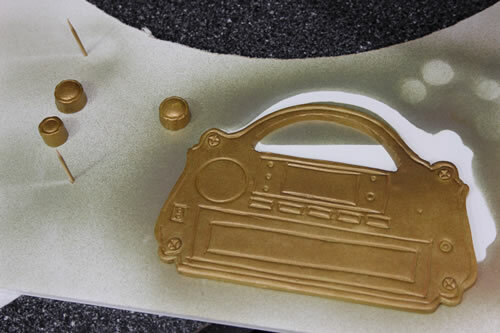 I try to keep as much of my cakes edible as possible but sometimes there are some pieces that just need stronger support than what edible materials can provide. That was the case with the lid. I had to use foam board since it was so large and was going to have little support. So I measured and cut it out then checked it on top of the cake before covering it in fondant. 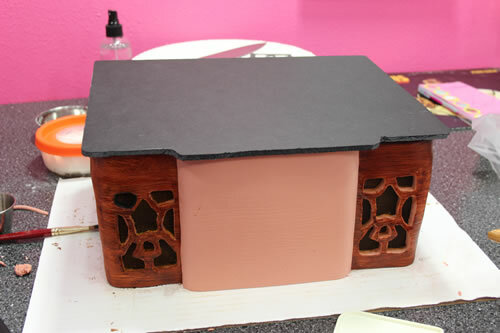 I first covered the bottom of the lid, by attaching the fondant with piping gel. I colored it then let it dry for a day before flipping it over and covering the top as well. 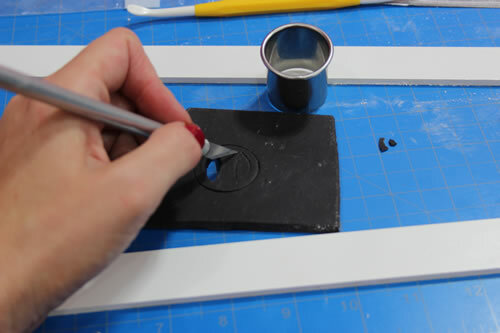 To trim out the speaker cut outs, I cut thin strips of black fondant and placed them inside the edges of the cutouts. As you can see in the photo, the petal dust that I had originally brushed on the speakers looked terrible. Most of it rubbed off and, what was left looked clumpy and dirty. I ended up using a paint brush, dipped in Vodka, to clean it all off and kept it just black. 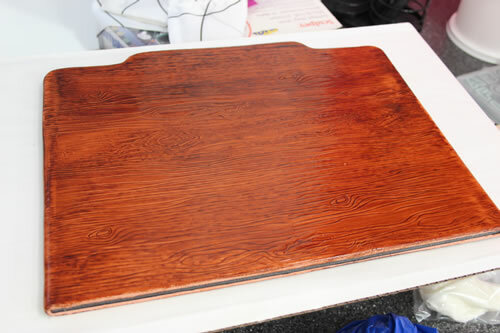 Now I took a break from the cake and prepared the base board so that it would have time to dry. 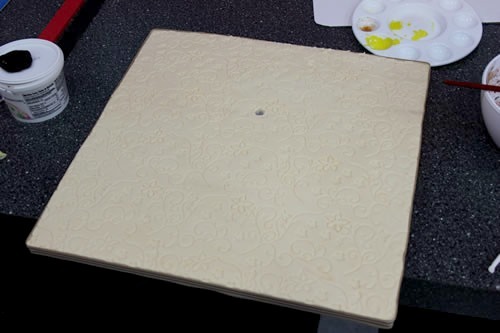 I rolled out a large piece of cream colored fondant then pressed an impression mat on it to give it texture. 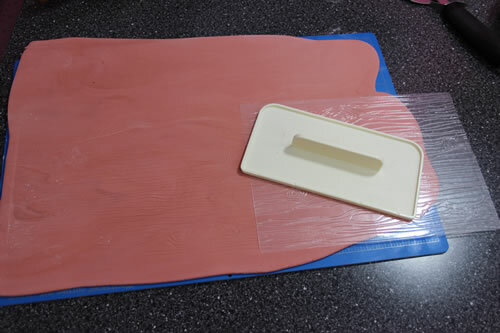 I then attached it to my cake board with some piping gel, cut out a hole for the motor wires, glued some ribbon around the edges, and then left it to dry overnight. Once dry, I flipped it over and attached some felt chair pads to the bottom so that they would raise the baseboard up just enough for the wires to slide underneath it. 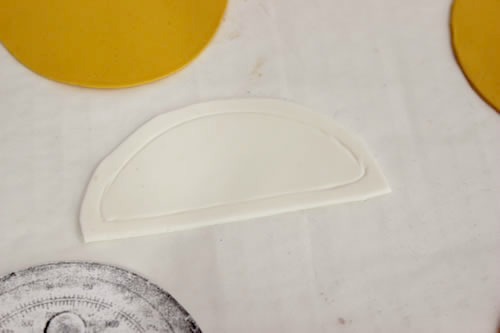 For the face plate, I rolled out some yellow gum paste then used my pattern to cut it out with an X-Acto knife. I poked indentions where corners were with my veining tool so that I could use those as markings. I then removed the pattern and used the markings as guides to freehand all the lines with my veining tool. I used a decorating tip to make the circle indentions. 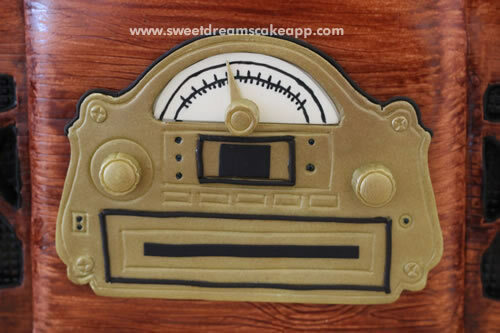 For the knobs, I rolled out a thick piece of yellow gum paste then used a small round cutter to cut them out and then another, even smaller, round cutter to make the circle indention. To make the sides bumpy, I used a sewing gauge to press indentions all around. 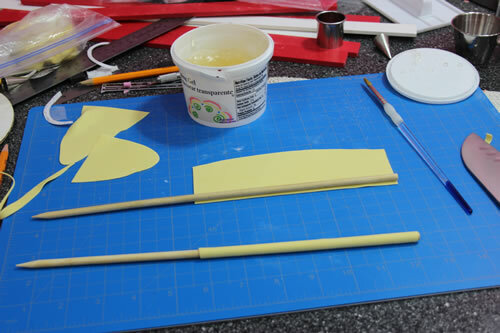 For the lid support, I used a wooden dowel rod and covered the top half of it in yellow gum paste. Again, I made two, just in case. When all the yellow pieces had dried, I used my airbrush to color them gold. 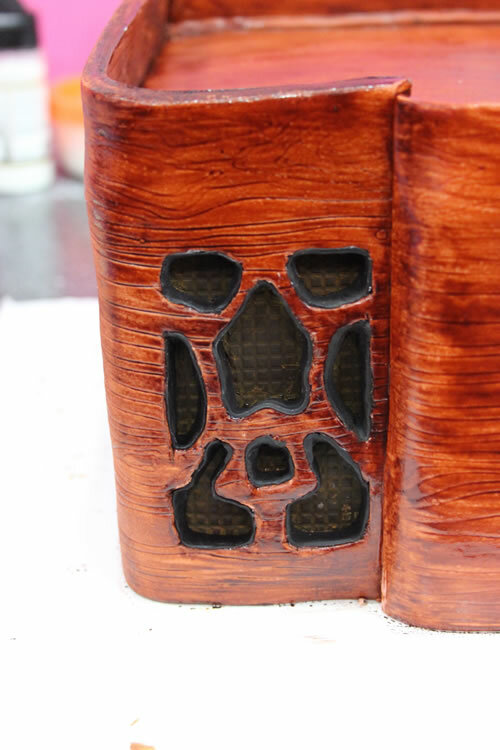 For the back of the face plate (where the dial and number are) I used my pattern and cut out a piece of white gum paste that was slightly larger than the pattern and made an indention of the pattern in it. I wanted it larger so that you wouldn’t accidentally see cake behind it if it didn’t line up perfectly with the face plate. Once dry, I used an edible marker to draw on all the lines and numbers. 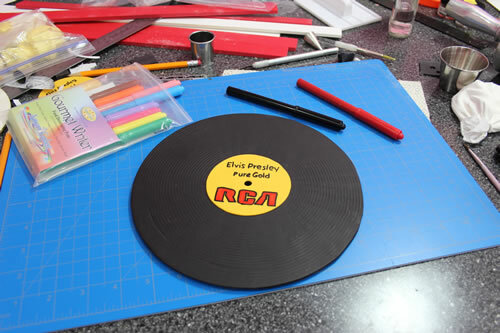 I also used edible markers to draw the wording on the dried gum paste record label. I then attached the record label on to the record and attached the face plate backing on to the back of the face plate. I attached the face plate on to the cake with some melted candy melts and then cut thin pieces of black fondant and attached them with piping gel to trim out everything. The final pieces were all made out of black modeling chocolate. I used a circle cutter and X-Acto knife to make the 45 adapter. Then freehand cut other trim pieces. 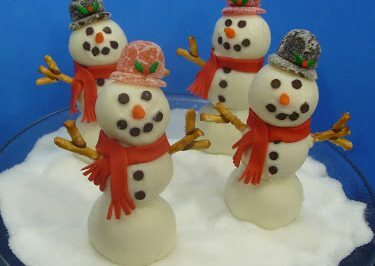 For the arm, I used a lollipop stick and attached modeling chocolate pieces to the ends. I added silver color to the arm and some of the other pieces by brushing on silver luster dust mixed with some Vodka. Finally I cut out the letters for the base board with alphabet cutters. Now to assemble it all. 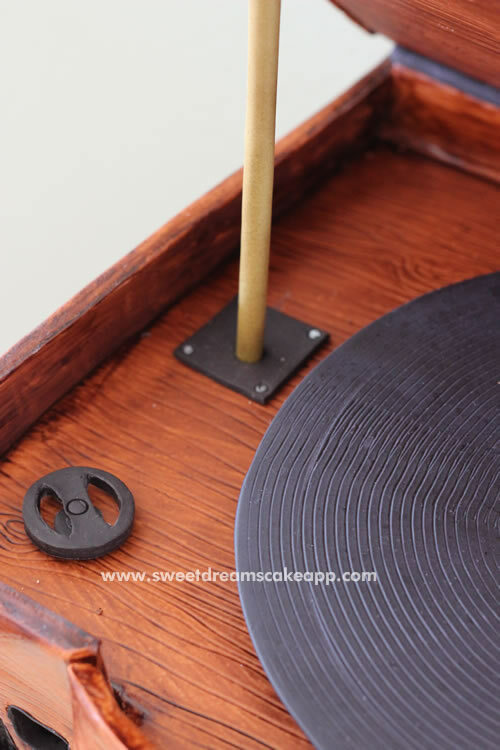 I attached the cake onto the base board with some melted candy melts then ran the wires of the motor down through the holes and out under the board. I stuck foil at the bottom of the PVC pipe to help position the motor then stuck a few toothpicks on the sides of it to hold it securely in place. My husband then finished wiring everything so we could plug it in an outlet. (*See bottom for his full explanation of how to wire the motor.) 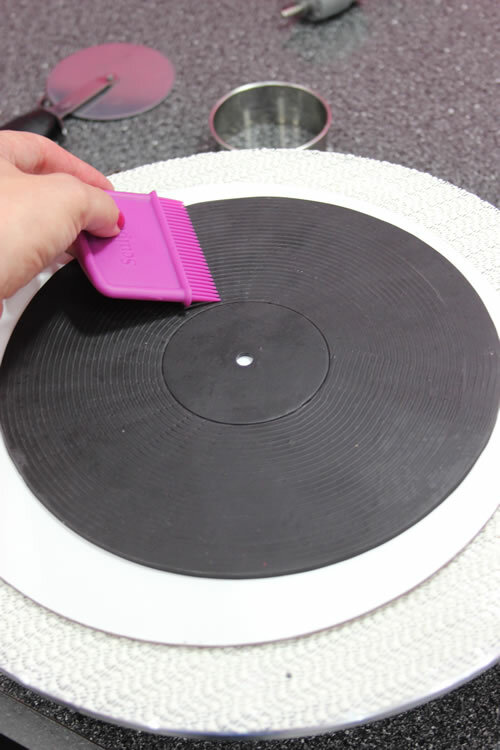 After making sure it worked, I laid a 6 inch cake board on it for a base then attached the record to that cake board with a little piping gel. With the record in place I could figure out where to place all the other pieces. I even added a small piece of silver colored toothpick on the bottom of the arm to look like a needle. When you use non-edible parts, be sure to let the people eating it know they are there. The final step was attaching the lid. I stuck the dowel rod support into the cake, making sure it was in a good position to hold a decent amount to the weight of the lid. 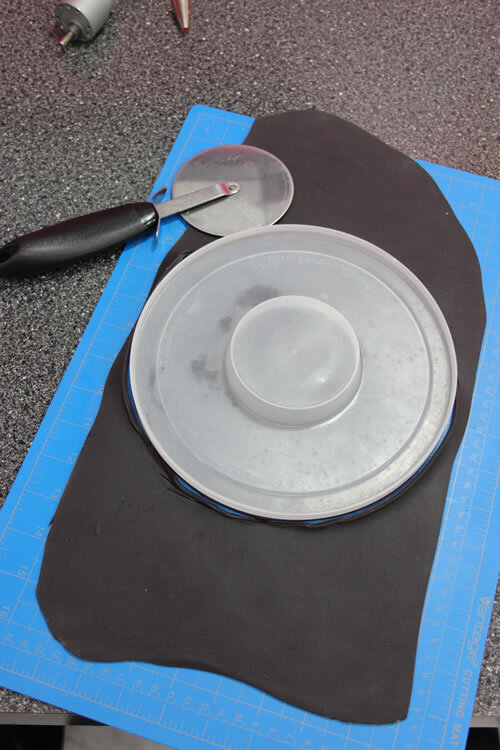 I don’t usually like to use hot glue around a cake (I mostly use melted candy melts) but I needed to make sure that my adhesive would be strong and dry fast since the lid was so heavy. 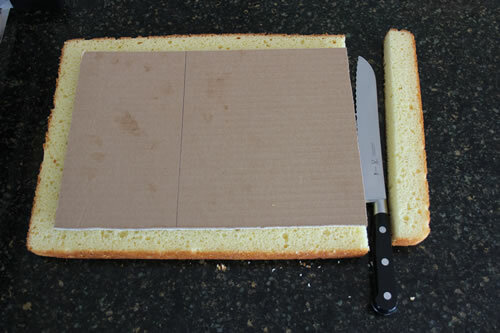 Also, I was going to be the one serving the cake so I knew how to cut it to avoid any glue. I placed a dab of hot glue on the top of the support and then another long line of it along the top of the back foam core wall. I put the lid in place and, thankfully, it held. 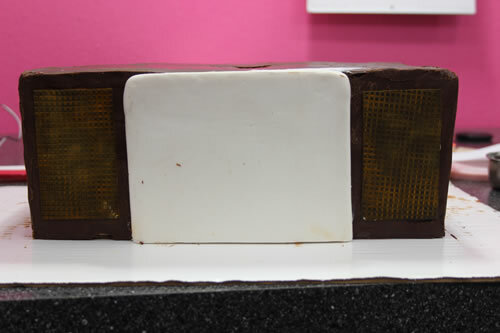 You could see the glue blobs at the seam so I took another long strip of black modeling chocolate and trimmed out where the lid and back wall attach so that you could no longer see any of the glue. Finally I attached the birthday wish to my daughter on the base board and it was done! Here is my beautiful daughter, Faith, with her cake at her birthday party. We ordered the motor with a specific RPM range to duplicate the speed of a 33 1/3 RPM record. Motors can be ordered with various input voltages, and I suggest that you order one from 9-12v as it will be easier to obtain the correct voltage transformer. I happened to have a 12v transformer from an old cordless phone, so we ordered a 12v motor to fit it. Note – proper precautions need to be taken when messing with wiring as even 12 volts can lead to injury, and 110v or 220v can lead to serious injury or death. 1) Cut a section of 2-conductor wire to approximately 12″ long. 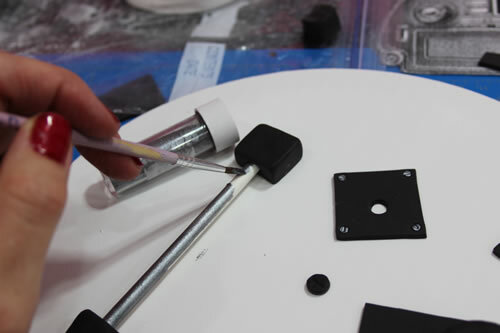 This will be attached to the motor and receive the female connectors sticking out of the bottom of the cake board. Strip the ends of the wires on all ends. 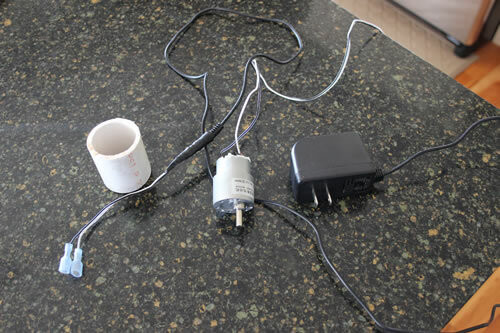 2) Determine which wire should go to which terminal on the motor (hook up temporarily to the transformer make sure it’s spinning in the direction you desire – clockwise in most records). Electrical motors are typically reversible, so reversing the wires will cause the motor to spin in the opposite direction. Mark the wires and terminals on the motor for easy connections. ¡¡¡¡Impresionante!!!!! me parece una auténtica obra de arte. Enhorabuena. Do you notice something different? ?